Jay David Bolter posits that words are a medium of logic while pictures are a medium of emotion; thus, images reveal the emotional response of an illustrator to a literary text. 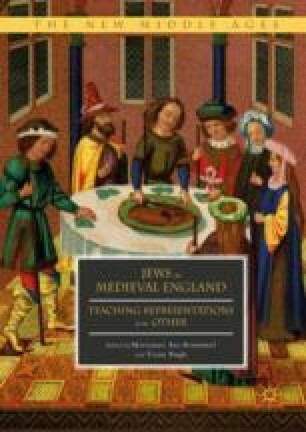 To determine students’ reactions to Chaucer’s Prioress’s Tale and its portrayal of Jews, students are given the following assignment: “You’ve been hired as an illustrator for The Canterbury Tales. Draw one picture for the Prioress’s Tale.” This assignment also includes reviewing historical responses to the tale, ranging from illustrations from the Middle Ages to the present drawings of students, which provides a picture of reader reactions from the past to present of the Jewish Other in The Prioress’s Tale. This simple drawing assignment encourages students to explore the difficult issues raised by the tale.